India population is poised to surpass China's as the world's largest. The India population is the second largest in the world; China's is the first. The Chinese population and Indian population are each so enormous that it's hard for a westerner to wrap our brain around the numbers! The United State's Central Intelligence Agency ("CIA") estimated that as of July 2012, India's population will be 1,205,073,612 and the CIA estimates China's will be 1,343,239,923. This means the reported India population will have about 138,000,000 fewer inhabitants than China. To help you digest this information and put it into perspective, the United States of America is the world's third most populated country, and according to the CIA, the U.S. will have a population of only 313,847,465 as of July 2012. This means that if you multiplied every single person in the U.S. by 4, the United States would still not have as big a population as India. As I mentioned before, China is more populated than India, but it looks like that won't be the case for much longer. The rate a country's population growth is measured by is known as a population growth rate. The population growth rate takes into account the number of people born in a country each year and the number that die each year. By using these figures, a countries population growth can be accurately estimated. The population growth rate of India is roughly 1.312%, the U.S.'s is about .899% and China's is only .481%. So why is China's population growth rate less than half of India's? There are several major factors that play into the difference. China's government has had mandatory birth restrictions in place for its people in order to prevent its population from growing any faster. These restrictions prevented the Chinese people, who lived in China, from having as many children as they might have otherwise had; India has had no such restrictions in place. 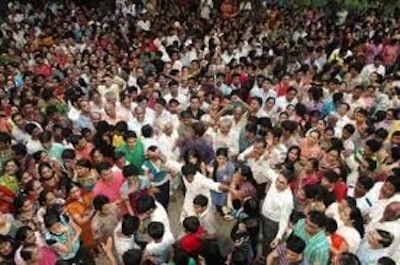 In addition, India's family oriented culture encourages people to have many children. So mathematically, if the population growth rates of China and India remain steady, India may become the world's most populated in country in the next decade; it grew by 188,000,000 people in the last one! Leave India population to expore India's culture.